The battleground, where I wage war against my personal demons. Determining your writing process isn’t just about brainstorming and planning, it’s also about conquering the personal demons that are holding you back. For me, writing has been as much about personal growth as it has been about learning the correct use of the semi-colon. It’s hard and scary, but in the long run, it’s more than worth it. More than with your writing process, you need to find your own way to deal with the things that hold you back. Here’s how I’m dealing with one of mine. There’s a small(ish) spiral-bound book on my bedside table that I use to express all of the things that tick me off or make me anxious. It’s not a diary. Once I’ve written that negative thing down, I rip out the page, scrunch it up and throw it in the bin (the recycling bin – I am a tree-hugger). The process of physically expressing my thoughts/emotions and then tossing them out, is hugely therapeutic. I always feel much better afterwards. 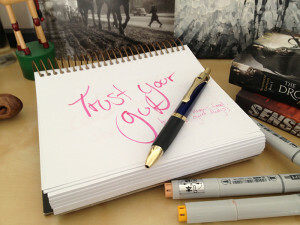 As well as the negative things, I also write down positive reminders to myself, such as “trust your gut” (because I tend to over-think things) and “what if everything turned out brilliantly?” (because I lean towards pessimism). These I don’t scrunch up and throw away, these I leave in my notebook for those days when life is gloomier than usual. How do you deal with your personal demons? This is a cool idea. I have so many little notebooks lying around that I may try this! This post is pure serendipity. I am currently enjoying Roy Peter Clark’s, Help for Writers (Little, Brown and Co – 2011), where he offers hundreds of tips for using a notebook and seeing impossible possibilities every day. He explores seven key steps in writing and you can’t not read every single word. So put Clark and your notebook side-by-side. He definitely sprinkled a little bit of magic dust on my writerly observation skills. Thanks for the recommendation, I’ll definitely look it up. Just a PS – I wonder if there is a way of setting up an interim step to be able to see the text you have just written as it will appear in the comments. I write on an iPad mini and the text is always chasing the pop up keyboard, and as it scrolls I lose sight of simple errors – such as ‘is post is’. When the comment appears it is too late to correct errors or odd artefacts that happened over a line break or because of disappearing text. PPS – this site has been such a wonderful and unexpected discovery – thank you. That first PS is a great question. There probably is a plugin that does that, I just haven’t found it yet. On the PPS, I’m really glad that you’re getting something out the blog, if you ever have any questions or just want to chat, send me an email. Great idea for dealing with personal demons! I want to try it out!